Advanced Startup Options (Windows 10). Advanced Startup Options (ASO) is a centralized menu of recovery, repair, and troubleshooting tools in Windows 10 and Windows 8. The ASO menu is also sometimes referred to as the Boot Options menu. Advanced Startup Options replaced the System Recovery Options menu available in Windows 7 and Windows Vista. Some sources still refer to Advanced Startup Options menu in Windows 8 as System Recovery Options. Windows Recovery Environment (WinRE) is yet another name you might see that's synonymous with Advanced Startup Options. Advanced Startup Options also contains the Startup Settings menu which, among other things, is used to start Windows 10 or Windows 8 in Safe Mode. There are a number of ways to get to the Advanced Startup Options menu. The easiest way to access ASO depends on the situation you're in that's prompting the need to use one of these tools. See How to Access Advanced Startup Options in Windows 10 & 8 for detailed instructions on each method. If you can access Windows normally, the quickest way to start Advanced Startup Options in Windows 10 is via is Settings > Update & Security > Recovery. In Windows 8, try PC Settings > Update and Recovery > Recovery. Take a look at the tutorial we linked to above if that's not possible or you need more help. Advanced Startup Options is just a menu of tools - it doesn't, itself, do anything. Choosing one of the available tools or other menus from Advanced Startup Options will open that tool or menu. In other words, using Advanced Startup Options means using one of the available repair or recovery tools. Some items available from Advanced Startup Options are nested inside of other menus. If you need to back up, use the left arrow with the circle around it which you'll find to the left of the menu heading at the top of the screen. Below is every icon or button you'll see on the Advanced Startup Options menu in Windows 10 and Windows 8. I'll call out any differences between the two versions of Windows. If the menu item leads to another area of the menu, I'll explain that. If it starts some recovery or repair feature, I'll give a short description and link to more detailed information on that feature if we have it. If you've configured a dual-boot system, you may also see Use another operating system (not shown here) on the main Advanced Startup Options menu. Continue is available on the main Choose an option screen and says Exit and continue to Windows 10... (or Windows 8.1/8). When you choose Continue, Advanced Startup Options will close, your computer will restart, and Windows 10 or 8 will start in normal mode. Obviously, if Windows isn't starting properly, the very fact that brought you to Advanced Startup Options, heading right back into Windows probably won't be helpful. However, if you found yourself on the ASO menu some other way, or are done with some other repair or diagnostic process, Continue is the quickest way out of Advanced Startup Options and back into Windows. Use a device is available on the main Choose an option screen and says Use a USB drive, network connection, or Windows recovery DVD. On most computers, you'll see options for USB storage devices, DVD or BD drives, network boot sources (even if you don't really have one of those set up), etc. Only UEFI systems will have a Use a device option on Advanced Startup Options. Troubleshoot is available on the main Choose an option screen and says Reset your PC or see advanced options. In Windows 8, it says Refresh or reset your PC, or use advanced tools. The Troubleshoot option opens up yet another menu, containing the Reset this PC and Advanced options items, both of which we discuss below. The Troubleshoot menu is where all of the repair and recovery features found in Advanced Startup Options are located and is what you'll want to choose if you want to do anything other than exit the ASO menu. On some UEFI systems, you may also have a UEFI Firmware Settings option (not shown here) on the Troubleshoot menu. Turn off your PC is available on the main Choose an option screen. Reset this PC is available from the Troubleshoot screen and says Lets you choose to keep or remove your files, and then reinstalls Windows. Tap or click on Reset this PC to start the Reset This PC process, where you're given two additional options, Keep my files or Remove everything. The first option, great for when your computer is running slow or is buggy, removes all installed software and apps and resets all Windows settings, but nothing personal will be removed, like documents, music, etc. The second option, much like a "factory reset" and great for starting over completely or before getting rid of your computer, removes everything, including installed apps and programs, settings, personal files, etc. See How to Reset Your PC in Windows 10 or Windows 8 for a walkthrough of this process, including more on which choice is best. 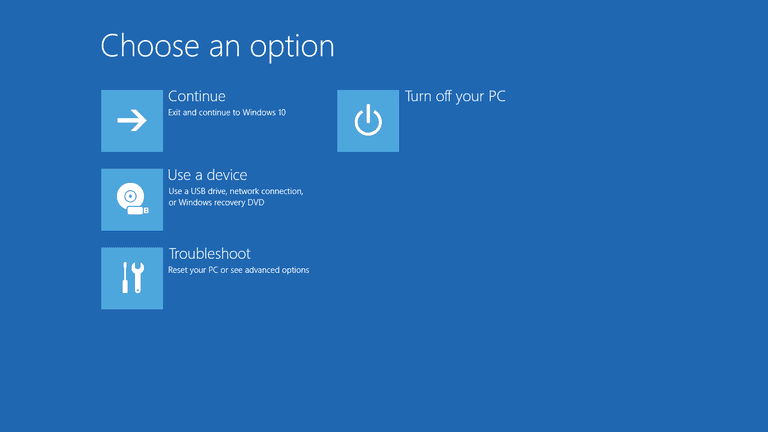 In Windows 8, the first option above is called Refresh your PC and the second Reset your PC, both of which are available directly from the Troubleshoot screen. Advanced options is available from the Troubleshoot screen. The Advanced options option opens up yet another menu which contains the following items: System Restore, System Image Recovery, Startup Repair, Command Prompt, and Startup Settings, all of which we explain below in their own sections. In Windows 10, if you're part of the Insider testing program, you'll also see a Go back to the previous build option. The Advanced options menu is most similar to the System Recovery Options menu found in earlier versions of Windows. System Restore is available from the Advanced options screen and says Use a restore point recorded on your PC to restore Windows. The System Restore option starts System Restore, the same time-machine-like "undo" tool you may have used or seen from within Windows. A huge advantage of having the ability to use System Restore from the Advanced Startup Options menu is that you're doing so from outside of Windows 10/8. For example, if you suspect some driver or registry issue is preventing Windows from starting properly, but find yourself in the unfortunate situation of not being able to start Windows so that you can then start System Restore, this option becomes very valuable. System Image Recovery is available from the Advanced options screen and says Recover Windows using a specific system image file. This is a great option if you've unsuccessfully tried other tools available on the Advanced Startup Options menu. Of course, to use this, you or your computer maker must have proactively created a system image to re-image from. Startup Repair is available from the Advanced options screen and says Fix problems that keep Windows from loading. The Startup Repair option starts, you guessed it, an automated startup repair procedure. If Windows 10 or Windows 8 isn't starting properly, like due to a BSOD or a serious "missing file" error, Startup Repair is an excellent first troubleshooting step. Early versions of Windows 8 referred to Startup Repair as Automatic Repair. Command Prompt is available from the Advanced options screen and says Use the Command Prompt for advanced troubleshooting. Most commands that are available from the Command Prompt in Windows are also available in the Command Prompt included here as part of Advanced Startup Options. When using the Command Prompt from Advanced Startup Options, be sure to verify the correct drive you're executing commands on. In most Windows installations, the drive Windows is installed on is designated as C while inside Windows 10/8 but as D while in the ASO menu. This is because the C drive letter is given to a 350 MB system reserved partition that's normally hidden when you're in Windows, leaving D to be assigned to the drive Windows 10 or Windows 8 is installed on. If you're not sure, use the dir command to inspect the folders. Startup Settings is available from the Advanced options screen and says Change Windows startup behavior. Startup Settings is not available from Advanced Startup Options when accessed in certain ways. If you don't see Startup Settings but need access to the startup modes on that menu, see How to Start Windows 10 or Windows 8 in Safe Mode for help. The Advanced Startup Options menu is available in Windows 10 and Windows 8. Some of the diagnostic and repair options available from Advanced Startup Options are also available in Windows 7 and Windows Vista from System Recovery Options. In Windows XP, few of these tools are available but what are can be reached from Recovery Console or via a Repair Install.